How effectively are you using directories in your family history? In this episode, we're taking a deeper look at Canadian historical directories. 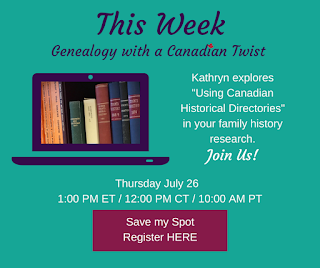 Kathryn demonstrates how information in directories can help solve problems, and add details to your ancestors' lives. CLICK the button above to register. Be sure to subscribe to our Weekly Webinar mailing list to receive registration and replay details right in your inbox.